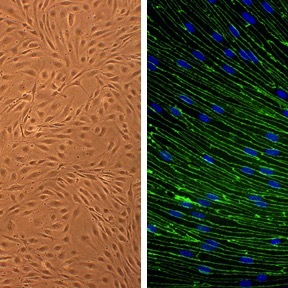 Rat Brain Microvascular Endothelial Cells (RBMVEC) from Cell Applications, Inc. provide an excellent model system to study many aspects of endothelial function and disease, especially those related to the blood-brain barrier (BBB), including interactions between neurons, astorcytes and endothelial cells, brain cognitive function, search for therapeutic modulators, and develop novel drug delivery methods for crossing the BBB. 500,000 RBMVEC (2nd psg) frozen in Basal Medium w/ 10% FBS, 10% DMSO. Alluri, H., M. Grimsley, C. Shaji, K. Varghese, S. Zhang, C. Peddaboina, B. Robinson, M. Beeram, J. Huang and B. Tharakan. 2016. Attenuation of Blood-Brain Barrier Breakdown and Hyperpermeability by Calpain Inhibition. J Biol Chem, jbc.M116.735365. Alluri, H., R. Wilson, C. Shaji, K. Wiggins-Dohlvik, S. Patel, Y. Liu, X. Peng, M. Beeram, M. Davis, J. Huang and B. Tharakan. 2016. Melatonin Preserves Blood-Brain Barrier Integrity and Permeability via Matrix Metalloproteinase-9 Inhibition. PLoS ONE 11(5): e0154427. Meijer, R, S. Gray, K. Aylor and E. Barrett. 2016. Pathways for insulin access to the brain: the role of the microvascular endothelial cell. Am J Physiol – Heart & Circ Physiol, 311:H1132-H1138. Patel, C., Z. Xu, E. Shosha, J. Xing, R. Lucas, R. Caldwell, R. Caldwell and S. Narayanan. 2016. Treatment with polyamine oxidase inhibitor reduces microglial activation and limits vascular injury in ischemic retinopathy. BBA Molec Basis of Disease, 9:1628-1639. Zhou, T., J. Rivera, V. Bhosle, I. Lahaie, Z. Shao, H. Tahiri, T. Zhu, A. Plosa, A. Dorfman, A. Beaudry-Richard, S. Costantino, G. Lodygensky, P. Lachapelle and S. Chemtob. 2016. Choroidal Involution Is Associated with a Progressive Degeneration of the Outer Retinal Function in a Model of Retinopathy of Prematurity: Early Role for IL-1β. Am J Pathol, 186:3100-3116. Altmann, J., G. Yan, J. Meeks, M. Abood, E. Brailoiu, and G. Brailoiu. 2015.G protein-coupled estrogen receptor-mediated effects on cytosolic calcium and nanomechanics in brain microvascular endothelial cells. J Neurochem, online: 2 MAR. DOI: 10.1111/jnc.13066. Anand, P., A. O’Neil, E. Lin, T. Douglas, and M. Holford. 2015. Tailored delivery of analgesic ziconotide across a blood brain barrier model using viral nanocontainers. Nature, Scientific Reports, 5: Article 12497, doi:10.1038/srep12497. Brailoiu, G., E. Deliu, L. Bram, J. Soboloff, M. Abood, E. Unterwald, and E. Brailoiu. 2015. Cocaine Inhibits Store-Operated Ca2+ Entry in Brain Microvascular Endothelial Cells: Critical Role for Sigma-1 Receptors. Biochem J, DOI: 10.1042/BJ20150934. Deosarkar, S., B. Prabhakarpandian, B. Wang, J. Sheffield, B. Krynska and M. Kiani. 2015. A Novel Dynamic Neonatal Blood-Brain Barrier on a Chip. PLoS ONE 10(11): e0142725. Sitaras, N., J. Rivera, B. Noueihed, M. Bien-Aime, K. Zaniolo, S. Omri, D. Hamel, T. Zhu, P. Hardy, P. Sapieha, J. Joyal, and S. Chemtob. 2015. Retinal Neurons Curb Inflammation and Enhance Revascularization in Ischemic Retinopathies via Proteinase-Activated Receptor-2. The American Journal of Pathology, 185:581-595. Zarebkohan, A., F. Najafi, H. Moghimi, M. Hemmati, M. Deevband, and B. Kazemi. 2015. Synthesis and characterization of a PAMAM dendrimer nanocarrier functionalized by SRL peptide for targeted gene delivery to the brain. Eu J Pharm Sci, doi:10.1016/j.ejps.2015.06.024. Alluri, H., H. Stagg, R. Wilson, R. Clayton, D. Sawant, M. Koneru, M. Beeram, M. Davis, and B. Tharakan. 2014. Reactive Oxygen Species-Caspase-3 Relationship in Mediating Blood–Brain Barrier Endothelial Cell Hyperpermeability Following Oxygen–Glucose Deprivation and Reoxygenation. Microcirculation, 21:187-195. An, J., W. Haile, F. Wu, E. Torre, and M. Yepes. 2014. Tissue-type plasminogen activator mediates neuroglial coupling in the central nervous system. Neuroscience, 257:41-48. Schock, S., H. Edrissi, D. Burrger, R. Cadonic, A. Hakim, and C. Thompson. 2014. Microparticles generated during chronic cerebral ischemia deliver proapoptotic signals to cultured endothelial cells. BBRC, 450:912-917. Wen, J., S. Qian, Q Yang, L. Deng, Y. Mo, and Y. Yu. 2014. Overexpression of netrin‑1 increases the expression of tight junction‑associated proteins, claudin‑5, occludin, and ZO‑1, following traumatic brain injury in rats. Experimental and Therapeutic Medicine. 8:881-886. Wiggins-Dohlvik, K., M. Merriman, C. Shaji, H. Alluri, M. Grimsley, M. Davis, R. Smith, and B. Tharakan. 2014. Tumor necrosis factor-α disruption of brain endothelial cell barrier is mediated through matrix metalloproteinase-9. The American Journal of Surgery, 208:954–960. Alluri, H., H.W. Stagg, R.L. Wilson, R.P. Clayton, D. Sawant, M. Koneru, M.R. Beeram, M.L. Davis, and B. Tharakan. 2013. Reactive Oxygen Species-Caspase-3 Relationship in Mediating Blood-Brain Barrier Endothelial Cell Hyperpermeability Following Oxygen-Glucose Deprivation and Reoxygenation. Microcirculation: DOI: 10.1111/micc.12110. An, J., W.B. Haile, F. Wu, E. Torre, and M. Yepes. 2013. Tissue-type Plasminogen Activator Mediates Neuroglial Coupling in the Central Nervous System. Neuroscience. 257C:41-48. Tahiri, H., C. Yang, F.o. Duhamel, S. Omri, E. Picard, S. Chemtob, and P. Hardy. 2013. p75 neurotrophin receptor participates in the choroidal antiangiogenic and apoptotic effects of T-lymphocyte-derived microparticles. Investigative ophthalmology & visual science. 54:6084-6092. Danesh-Meyer, H.V., N.M. Kerr, J. Zhang, E.K. Eady, S.J. O'Carroll, L.F.B. Nicholson, C.S. Johnson, and C.R. Green. 2012. Connexin43 mimetic peptide reduces vascular leak and retinal ganglion cell death following retinal ischaemia. Brain. 135:506-520. Etame, A. 2012. Enhanced Delivery of Gold Nanoparticles with Therapeutic Potential for Targeting Human Brain Tumors. PhD Dissertation, U Toronto. Campos, F., T. Sobrino, P. Ramos-Cabrer, B. Argibay, J. Agulla, M. Perez-Mato, R. Rodriguez-Gonzalez, D. Brea, and J. Castillo. 2011. Neuroprotection by glutamate oxaloacetate transaminase in ischemic stroke: an experimental study. Journal of cerebral blood flow and metabolism. 31:1378-1386. Etame, A.B., C.A. Smith, W.C.W. Chan, and J.T. Rutka. 2011. Design and potential application of PEGylated gold nanoparticles with size-dependent permeation through brain microvasculature. Nanomedicine. 7:992-1000. Su, K.-H., S.-K. Shyue, Y.R. Kou, L.-C. Ching, A.-N. Chiang, Y.-B. Yu, C.-Y. Chen, C.-C. Pan, and T.-S. Lee. 2011. β Common receptor integrates the erythropoietin signaling in activation of endothelial nitric oxide synthase. J. Cell. Physiology. 226:3330-3339. Manda, V., R. Mittapalli, W. Geldenhuys and P. Lockman. 2010. Chronic exposure to nicotine and saquinavir decreases endothelial Notch-4 expression and disrupts blood-brain barrier integrity. J Neurochem, 115:515-525. Johansson, Å., J. Lau, M. Sandberg, L.A.H. Borg, P.U. Magnusson, and P.O. Carlsson. 2009. Endothelial cell signalling supports pancreatic beta cell function in the rat. Diabetologia. 52:2385-2394. Makino, A., J. Suarez, H. Wang, D. Belke, B. Scott, and W. Dillmann. 2009. Thyroid hormone receptor-β is associated with coronary angiogenesis during pathological cardiac hypertrophy. Endocrinology, 150:2008-2015. Yu, X, S. Lin, X, Chen, Z. Zhou, J Ling, W Duan, B. Chowbay, J. Wen, E. Chan, J. Cao, C. Li, and S. Zhou. 2007 Transport of Cryptotanshinone, a Major Active Triterpenoid in Salvia Miltiorrhiza Bunge Widely Used in the Treatment of Stroke and Alzheimer's Disease, Across the Blood-Brain Barrier. Current Drug Metabolism, 8:365-377. Zhou, Z., X. Chen, J. Liang, X. Yu, J. Wen, and S. Zhou. 2007. Involvement of P-glycoprotein and Multidrug Resistance Associated Protein 1 in the Transport of Tanshinone IIB, a Primary Active Diterpenoid Quinone from the Roots of Salvia miltiorrhiza, Across the Blood-Brain Barrier. Drug Metabolism Letters, 1:205-217.